UK construction PMI, ADP report, Caixin China service-sector PMI. 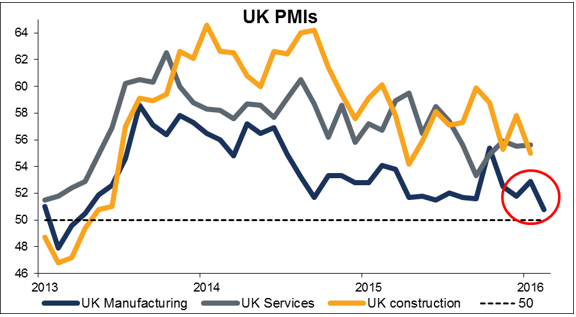 09:30 GMT UK Construction PMI (Feb):The UK manufacturing PMI, which had moved in a narrow range for the last 18 months, unexpectedly fell out of the bottom of the range in February, according to Tuesday’s data. The construction PMI is expected to rise, but so too was the manufacturing PMI. 13:15 GMT ADP report (Feb):The market is looking for some fall-back in the ADP employment report after January’s relatively high level, which far exceeded the non-farm payrolls of the month (205k vs an NFP of 151k). This would be simple mean reversion and would not imply any deterioration in the employment picture in the US. On the contrary, an ADP of 188k would be relatively robust and could further boost expectations of Fed tightening, thereby boosting the dollar. The figure may be a bit more confusing than usual as it includes the annual revisions. 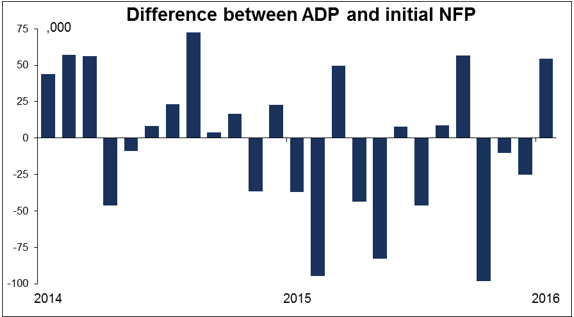 In any event, the absolute value of the difference between the ADP figure and the initial NFP since the beginning of 2015 is 47k or 22% of the NFP number, so it is an unreliable estimate at best.